The 2000 VW Cabriolet (Cabby) gauge cluster is a bolt-in modification. You simply remove your old cluster and plug in the Cabby cluster -- that's it! The cluster comes with fluorescent orange needles and blue back lighting for the LCD displays. The over-head lighting is an LED array that emits (from what I can observe) ultraviolet light or "black light", thus allowing the needles to glow at night. Even though the gauge cluster is from an OBD II vehicle, it will still work with an OBD I vehicle. The nice thing about the cluster for those of us with 'older' Mk.III's is that it has the rear fog ligh icon in the cluster. It also has the low-gas idiot light so when your fuel gauge needle hits the red zone the gas pump light will illuminate (when it lights up in my car it means I have about 31 miles of fuel left, maybe a couple more). I simply removed some of the bulbs from my original cluster and put them in the vacant holes in the Cabby cluster. I did take out the air bag light because that remained on, probably because I already have that idiot light to the left of my light switch. 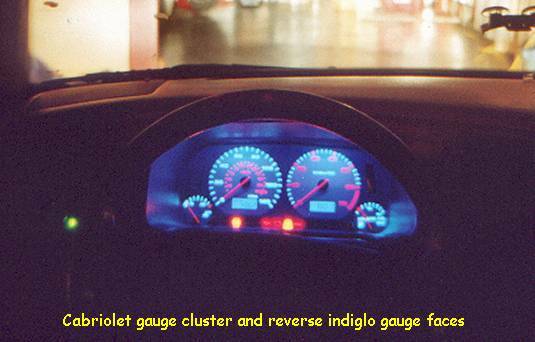 The particular cluster I bought used was from an automatic vehicle and the gear selector display was illuminated. Since my car is a manual shift I simply covered the gear selector display with black electrical tape and problem solved! Of course, to do this I had to remove the face covering to get to the gauge faces but that was no big deal as I did it after transfering my reverse indiglo gauges to the Cabby cluster. You can either buy the cluster from a VW dealership or go find a used one on-line like I did. I paid $86 for my unit, which included postage from California.